I cut the brown strip 2 inches wide and the red strips 1 inch wide. So the red strips finish at 1/2 inch wide. (I saw this variation on Mary's blog by one of her readers, but now I can't locate the post where Mary showed it off.) The rest of the fabrics are what I would consider "manly" fabrics. I am using outdoorsy prints, civil war reproductions, and at least five castoff shirts given to me by my (boy)friend who was getting rid of them anyway. One of the fabrics comes from his old welding coveralls. He had used duct tape to cover the rips in the knees, and the only usable part of the coveralls was the back, but I got a few good strips out of them! I'm having a lot of fun with this quilt and the easy block is fun and quick compared to the DWRQ. In other fun news, I found my mother's wedding dress! Well, not really. My grandmother made my mother's wedding dress when my parents got married in 1962. I remember the dress when I was child; my mother kept it in a gray box wrapped with a couple of pastel ribbons. I used to open it as a girl and look at it. I thought it was the most beautiful dress ever. It was in two pieces: a satin underdress that was strapless, and a lace overdress, with a bateau neckline, long sleeves, and basque waist. Unfortunately, in our last move before my father retired from the Army, the dress was lost. I was so disappointed. I loved that dress. About a dozen years later, my grandmother died, and all of her sewing supplies, including her patterns were sold or given away. I didn't start sewing until 2003, and since that time I have been on the lookout for the pattern that was used to make Mother's wedding dress. I had always hoped that if I got married, I could be married in the same dress. With the internet and the explosion of interest in vintage patterns, this search has allowed me to waste, I mean, enjoy, hours of my time looking at vintage wedding dress patterns. Now armed with the pattern number, I just googled it, found two of the patterns for sale, one of which was in my size. I ordered it pronto and I am now the proud owner of the pattern for this great dress. Rest assured, I'm in no danger of getting married, but if I do, I have the pattern for it!!!! 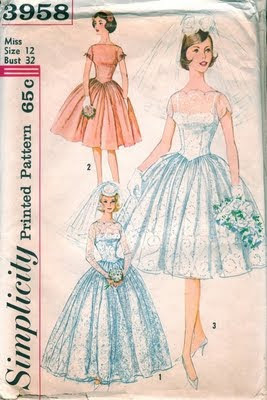 I'm thinking that my grandmother would be vastly amused that the pattern she paid 65 cents for in 1962 is worth $ 40.00 in 2009. Oh wow - what a beautiful wedding gown! That's too bad that it got lost, but having the pattern is wonderful. Maybe one day you'll be able to make your own. Yes, 30 minutes a day does pay off! I like the new quilt, too. Beautiful bride! The dress is so much prettier made up on your mother than the picture on the pattern. Time to Make A Jeans Skirt for Fall!